How We Shower in Our Van - Without a Bathroom! I think one of the hottest questions on everyones lips when they watch a video about vanlife, or find out you live in a van, is to ask ‘but how do you shower?’. This question seems like it has an obvious answer: we shower in a shower like many normal people. But that’s not the answer people are looking for, they want to know how and where (more importantly) do you shower? Anyway, getting back to showering. We don’t have the space, and we were concerned when we first moved into our van about how we would stay clean. Wet wipes and flannels are epic, but they can only do so much. These are very well known, and the technology is simple. In essence it is a black bag that you fill with water, leave in the sun for a couple of hours so the water heats up, then hang from a tree or somewhere higher than you so gravity can do it’s thing and push the water out the end and onto your dirty body. It’s simple, but it’s also a faff. We used ours once before realising it was irritating and it’s much easier to boil a kettle and use a bucket. Until this badass piece of equipment came into our lives. This is just purely the best van life shower you could dream of. 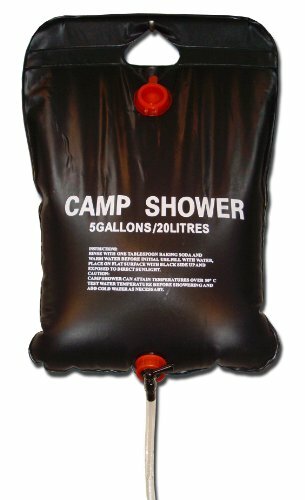 It’s not too big, requires zero power (except for a few pumps on the handle for pressure), and can produce enough hot water to wash your entire body, hair, and have a shave with water left over. This is a revelation for us! 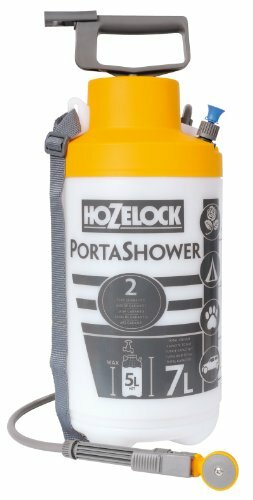 We purchased it for £25* off Amazon in the summer, and didn’t get round to using it until we’d been on the road in Portugal for about a month (no we’re not that stinky, we’ had showers at some of our friends places along the way). It can hold up to 7litres but says to only use 5litres, which is what I’ve done. We got into a habit of filling the shower up even when we didn’t need it as it meant we had the spare water for a shower whenever we really needed a shower. The perfect temp for me is to fill up (to the brim) one kettle of boiling water and mixing with the remaining cold water, this seems to be the best temp. A few pumps on the lever at the top and you have a wonderfully pressurised shower, it’s uh-may-zing. Life changing. Super great. *A lovely viewer spotted it for cheaper on Ebay! Check it out here. So yeah, that’s how we shower. If we’re in public I tend to shower with my bikini on, but Theo tends to go completely stark naked. He’s only been caught out once by a jogger and they were totally unfazed - in fact they stripped off themselves and went for a naked swim in the lake, so there ya go! We get a small percentage from the affiliate links in this article, and we only write about products we think are useful or have used :) thanks for reading. Newer PostOur Monthly VanLife Spending! Older PostTop 10 Vanlife Gifts!